The Red-footed & Blue-footed Boobies are a crowd favorite. After 38 tours to the Galapagos, I can confirm that the Galapagos Boobies are an inspiration for our nature lovers and photographers. 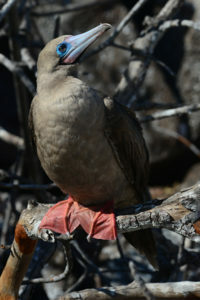 The Nazca, Red-footed and Blue-footed Boobies are conspicuous for their bright colors and size respectively. We get more questions about this bird than any other on the archipelago. Most of these are in regards to the brightly colored feet. 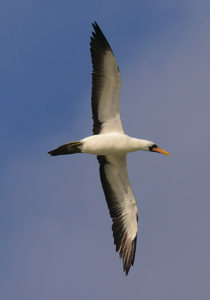 Boobies have both amazing and practical feet, which get their color from carotenoid pigments. 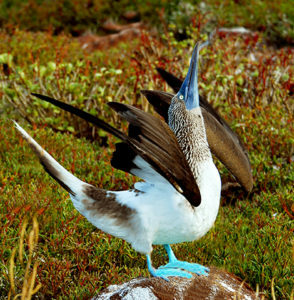 Blue and Red-footed boobies collect these carotenoids through their diet. These two species of boobies store concentrated pigment in their feet. The brighter the feet the healthier the bird. These entertaining birds not only stand out visually but literally march to the beat of their own drum, dancing to find mates. They do things their own way, incubating eggs by covering them with their feet! It takes from 42 to 55 days to hatch the eggs. Older chicks feathers can be so fluffy they often appear larger than their parents. These birds are both beautiful and charming; they are a memorable part of our tour.